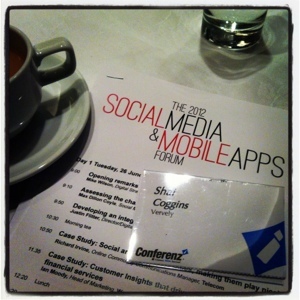 Over the last couple of days, I’ve been attending the 2012 Social Media and Mobile Apps Forum in Auckland, New Zealand. * It’s my first trip to NZ and it’s great to learn more about the use of social media and mobile technology in this part of the world. It’s also exciting to be attending an event as Vervely for the first time. 1. Mobile technology is getting ready to take centre stage. With mobile use forecasted to be overtaking PC use by the end of 2014, organisations and businesses’ next challenge is to understand what the rise of mobile use means for them. This can be anything from making sure that they have a mobile-friendly website to developing their own mobile app as a marketing or engagement medium. Or maybe, even just investigating what mobile advertising can do for them and their organisation. 2. Professional social media use needs to be measured. Even long before there were any social media measurement tools available like Radian6 or TwitSprout, I have always advocated the use of social media metrics and analysis. I’ve been creating social media dashboards** for as long as I have become a social media practitioner. This is because I have been trained to use data as a good way to show impact and tell stories. Any social media professional who says otherwise cannot be trusted. Yes, there are qualitative measures of social media. There are intangible benefits to social media. However, professional social media use would have tangible, quantitative benefits too. It’s important to understand what that means for specific organisations and businesses. For some, good social media use could mean increasing brand value or thought leadership. For others, improved leads and sales. Then, there are those who might equate this to lesser customer complaints. Or perhaps, improved recruitment processes. Whatever metrics your organisation or business decide upon, it’s important to find a way to measure that, in conjunction with the use of social media. 3. Know your local. Whether your target audience is hyperlocal, state-based, national, or international, it is important to understand your market intimately. Also, know what your competitors are doing in the space. Organisations and businesses need to see where the interplay is between location-based marketing, social, and mobile in order to be ahead of the curve. So, if you haven’t explored tools and applications like Google Places for Business, Google Maps, Bing Local, Foursquare, Cues, Facebook Places, and Trip Advisor, then do take the time to learn how they can suit specific campaigns and overall presence for your organisation or company. 4. It is important to claim your organisation’s value. Whether or not you intend to use a particular online space, it is best if you own that space so that it doesn’t give others a chance to hold your brand’s value to ransom. One example was when company Paperchase encountered a social media crisis, they found the Twitter handle that they wished to use as unavailable, as it was registered by a social media consultant who wanted to offer a service to them. This is a situation where ignoring social media didn’t protect the company, and in fact, it became detrimental. And no, this is not an isolated incident. This is one of the reasons I often advice people and organisations to stake their claim on their personal and professional brands online before they lose control of their web presence. 5. Engagement is key, regardless of the platform. It is important to remember that even though we’re dealing with technology, this space values authenticity, real interactions, and community development. So, it’s important to keep engagement in mind when using social media and mobile technology. Speakers line-up include: Mike Wikson (.99), Max D Coyle (Coyle Media Consultants), Justin Flitter (Flitter), Richard Irvine (Telecom), Ian Moody (Westpac NZ), Hayden Raw (The Common Room), Patrick Dodd (Reson8 Consulting), Simon Young (SyEngage), Paul McKenzie (RealEstate.co.nz), Jennifer Duval-Smith (Social @Ogilvy), Geri Ellis (Vodafone), Jenny Wilmhurst (Tweet Twins Social Media), Wayne Thomas & Sonali Mukherj (Hutt City Council), Graeme Russell (Adage Business & Media Services), Rob Cooke (Localist), Chris Maffe (Freestuff.co.nz), Duncan Shand (Young & Shand), Mark Copplestone (InMobi), Bill Rundle (Porter Novelli), and Katrine Evans (Office of the Privacy Commmisoner). After this two-day forum, I will be attending a half day workshop based on mobile technology. And, I hope to share a quick report from this too. ** This is subscriber-only content. Password will be available in July 2012 issue of Vervelycious. If you’re not subscribed yet, please sign up. It’s free. * Note: This trip is partly sponsored by my former employer, Connecting Up, Inc.